It is with great pleasure that Kristen Lorello announces, "Rachel Higgins: Logistics," an exhibition of new sculptures by the Brooklyn-based artist. The exhibition includes free-standing, wall-based, and hanging sculptures that examine concepts of materiality, utility, and display. Higgins presents a new series of interchangeable vessels which regard the aesthetics of logistics as a material unto itself. The exhibition follows from Higgins's continued practice of transforming building materials commonly used in corporate edifices into sculptures that engage the body directly. Sculptures in this exhibition are composed of materials used within mass shipping, maintenance, and organization, such as packing peanuts, corrugated sheets, MDF peg and slat board, as well as contemporary construction materials and wall-cladding components such as polystyrene, fiberglass, synthetic stucco, and spraystone. 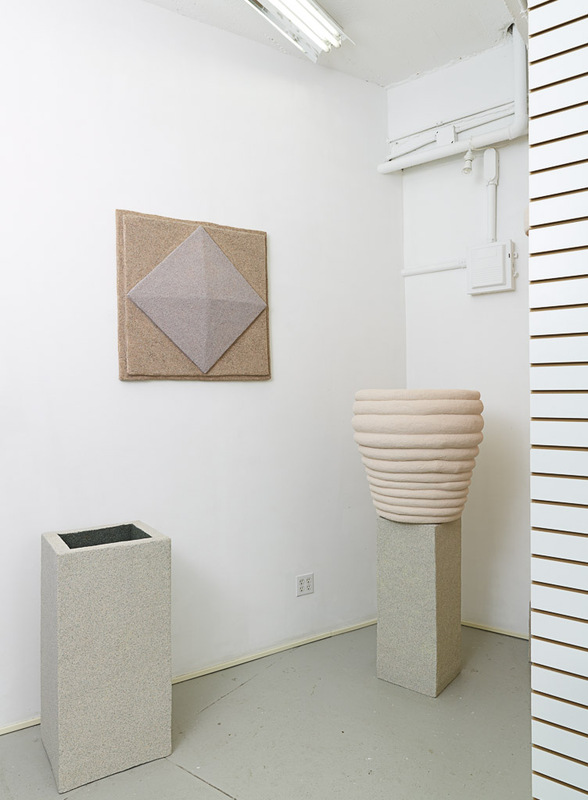 The exhibition’s sculptures conjure generic and familiar forms of planters, trashcans, pedestals, and organizers. Stacked and arranged interchangeably, the works confuse the figure/ground relationship. 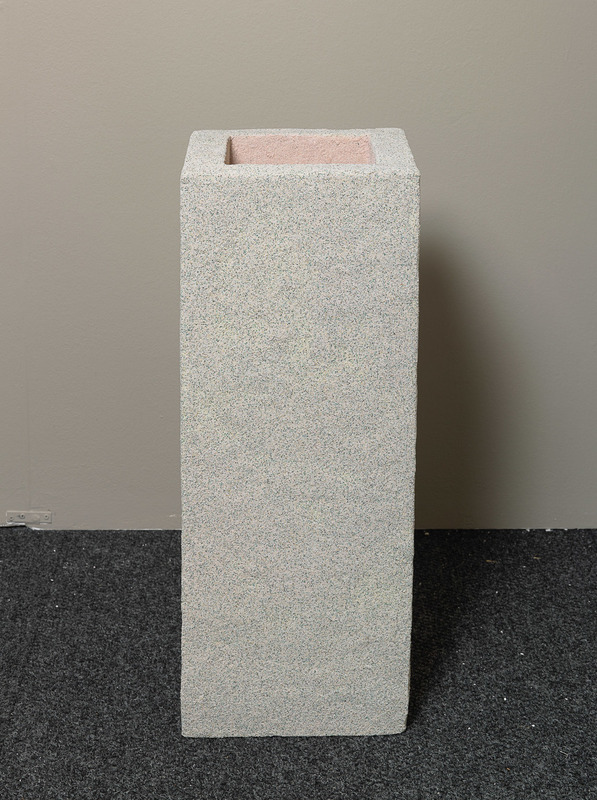 Pedestals become receptacles, sculptures become packaging, walls become sculptures, and the viewer is invited to determine use-value. A large bowl may serves as a seat, or an object to store unknown belongings. Hanging baskets and organizers signal display, or perhaps an unknown task to be completed. One wall within the gallery will be coated with cerastone, a false granite-like finish utilized in the construction of retail store facades. A bulb-lit work called "Sconce," and a motorized work, "Clock," also surfaced with synthetic stone, activate the space with disoriented light and movement. As Higgins has noted, "The work uses this corporate visual language and material, but confuses and refuses ideas of utility, efficiency, excess, security, containment. The work is about the abstraction and aesthetics of logistics, as a kind of absurd logistics-for-logistics-sake, logistics as a drive, logistics as a material." In 2011 Higgins was a resident at Build-it-Green, a salvage yard in Queens, where she was given access to a wealth of discarded construction materials and began re-shaping them by hand into sculptures that retained the minimal geometric look of design components of corporate buildings, suburban malls, and parks. Working with these remnants she began re-facading these objects in the same manner retail stores, apartment buildings and condos all over her neighborhood of Brooklyn do–-slathering them with synthetic stucco. Her 2011 outdoor installation, "Don't Worry About Buildings and Food," at Socrates Sculpture Park, included many of these large outdoor sculptures--cylindrical seating, a triangular archway, and stunted columns--that provided a contemporary ruin set for communal gathering. In a more recent performance included in "Out to See" in lower Manhattan in 2014, Higgins' transformed her sculptures into conduits of social interdependency by asking different passersby to help her carry them. Rachel Higgins (b. 1981, Laramie, WY) lives and works in Brooklyn, NY. 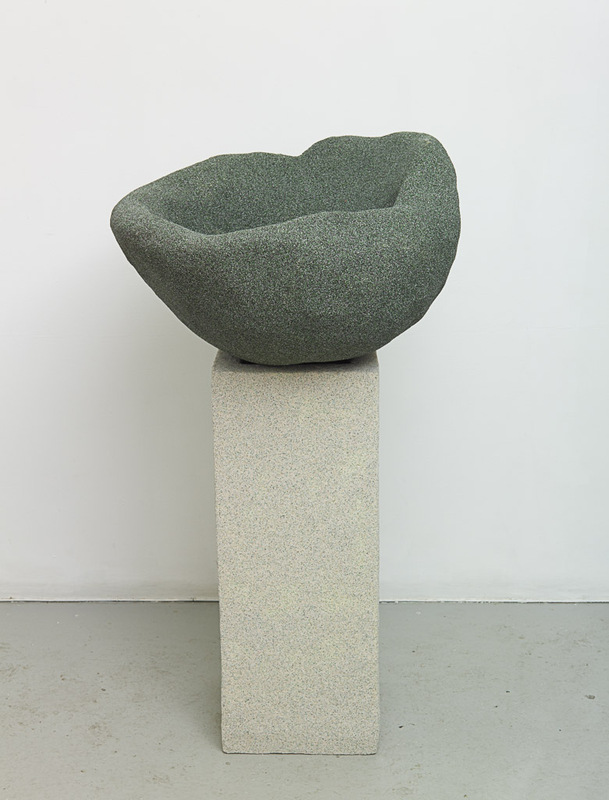 Her works have been broadly exhibited in exhibitions and public projects, including "I Serve Art," curated by Sara Reisman, Dolly Mass Gallery, SUNY Purchase, Purchase, NY (2015), "Several Circles," curated by Marco Antonini, Elizabeth Foundation for the Arts Project Space, NYC (2014), and "Do It (Outside)" presented by Independent Curators International, and Socrates Sculpture Park, Queens, NY (2013). She is the recipient of a 2013-14 artist residency at the LMCC Workspace Program, New York, was a 2012 Artist in Residence at Real Time & Space, Oakland, CA, and received a 2011 Emerging Artist Fellowship from Socrates Sculpture Park, New York. 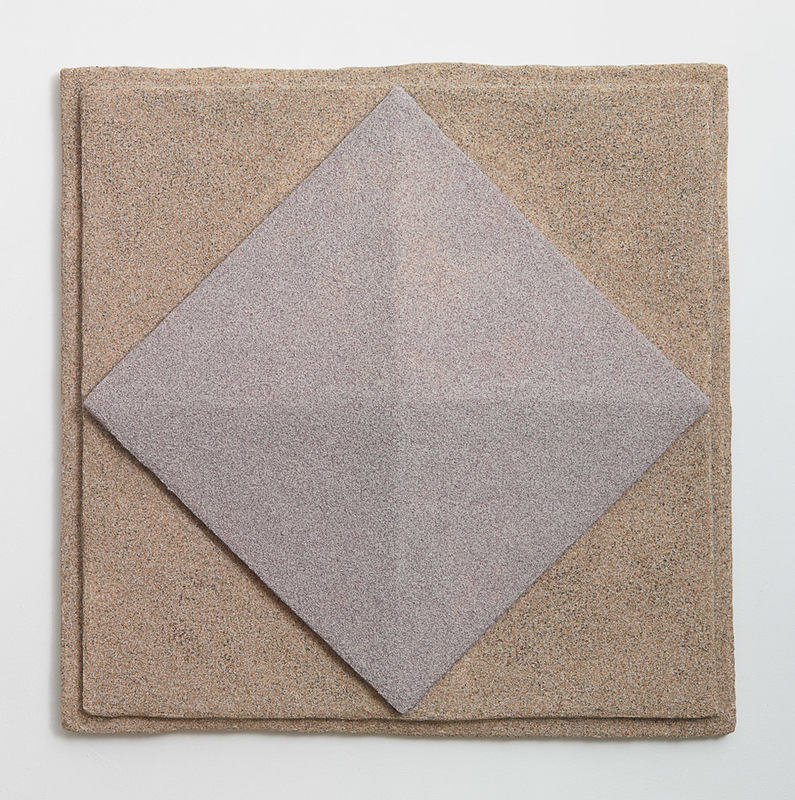 Higgins received an MFA from Hunter College, NY, in 2010.